First line: "This is the story of a boy who used to be a wolf and a girl who was becoming one." This sequel to Shiver continues with Grace enjoying her relationship with Sam, newly cured of his lycanthropy, while Grace's best friend Isabel still grieves over the recent death of her brother. Sam is struggling to deal with the permanence of his new situation, while still worrying over which of his wolf "family" will return to human form in the spring. In the meantime, a few of the new wolves that Sam's adoptive dad Beck recently created are having troubles. Recovering addict and famous rocker Cole is angry that his wolf change doesn't seem to be sticking... he'd been hoping to escape his human life by turning wolf. Cole's friend Victor, unwittingly turned wolf, seems to be having trouble staying in one form. Sam is, in every way, the perfect boyfriend... sensitive, poetic, genuinely thoughtful, undemanding. There is some tension as he's been sneaking into Grace's bedroom every night, not for prurient reasons, but just to snuggle. It isn't explicitly said, but implied, that despite their attraction, their frequent kisses and and despite their absolute rightness for each other, Grace and Sam are probably still virgins. When Grace's parents discover him in their daughter's bed they react with feelings of hurt and rage. They promptly assume the worst and ban Sam from their household, letting Grace know in no uncertain terms how disappointed they are in her. In the meantime, Grace and Sam both feel strongly that they want to get married. I thought this was interesting, because it's plenty common for high school girls to fantasize about marrying their boyfriend... but I'm not sure if young men usually harbor those same thoughts. Grace, predictably, feels embittered that her neglectful parents choose to get involved in her life at this late date. Grace, and to some extent, Sam, become desperate and emotional during their enforced separation. With Grace's 18th birthday only a few months away, they have very little to lose by simply lying low and waiting a little while until they can be together, even without Grace's parents blessing. However, they both feel the pain of separation keenly, and unable to bear even a few days without him, Grace runs away to stay with Sam at Beck's place at the edge of the woods. 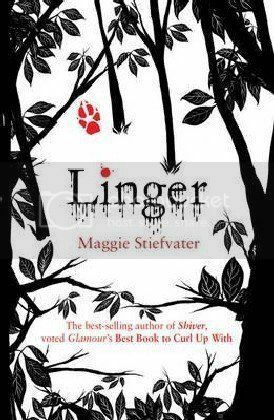 Linger adds the viewpoints of Cole and Isabel, who play counterpoint to Grace and Sam. While it's clear that Grace and Sam are meant to be, together forever, soulmates; Cole and Isabel, on the other hand, have a purely animal attraction, lending a dangerous feel to most of their interactions. Cole questions the whole premise that the change to wolf is caused by cold temperatures... he sees too many exceptions to the rule. Heavy foreshadowing with Grace's exposure to a werewolf bite as a girl made the ending totally predictable, but surprisingly I didn't mind. Even though I knew, pretty much from the second page, where the book was going, I still enjoyed the journey.